“Empire” co-stars are engaged to be married. 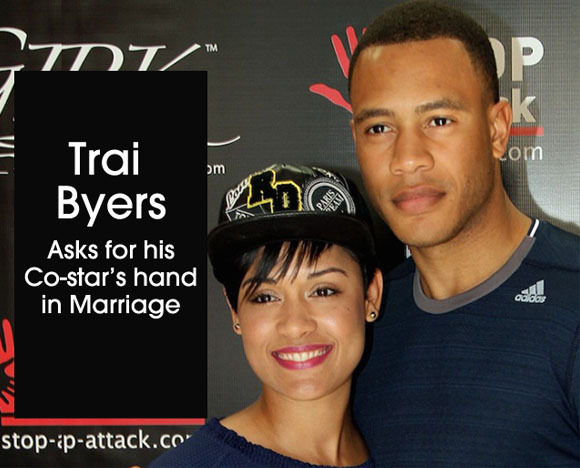 Trai Byers decided to make an honest woman of his co-star Grace Gealey. The actor for the hit TV show who was once quoted saying: “God is building an army all over the place, in Hollywood as well. So it feels good to be a part of it, ’made the proposal extra special, asking Gealey for her hand in marriage on her 31st birthday on Sunday, July 26. Gealey and Byers celebrated their engagement and her birthday with fellow costars and both took to Instagram to express their love for one another. “Empire” returns to TV on September 23, 2015. The first season was a phenomenal success for Fox, with 17.62 million viewers tuning in to see the season finale in March.